New and updated in November of 2018, including all the recent route changes! We just re-walked this Camino and our eBook guide is full of great, new advice for the pilgrimage traveler! It even includes the northern route to Muxía so you can choose which End of the World you want to walk to first! 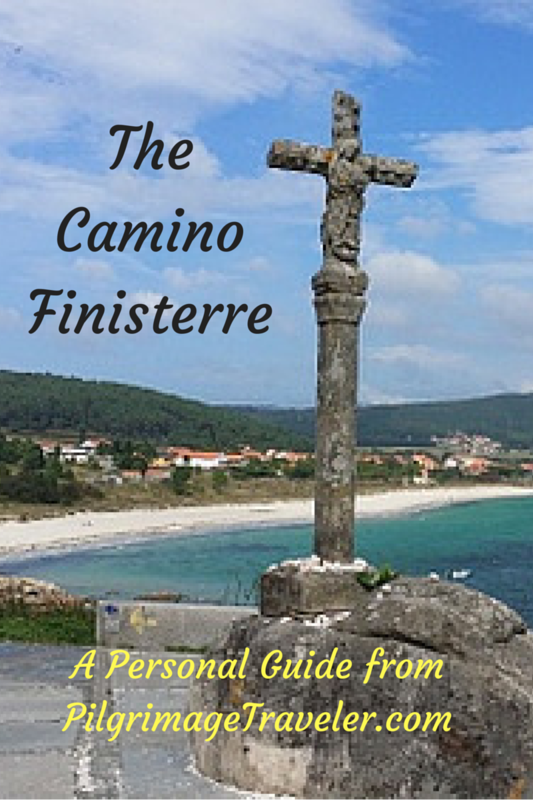 Our Camino Finisterre eBook is now available as a PDF file to download to your device. After you purchase the eBook by clicking the "Buy Now" button, just proceed through the screens. You do not have to have a PayPal account to purchase our product. Just use your credit card instead at checkout. Why an eBook of our web pages? After receiving feedback from our readers that they loved and used our information on their Caminos, but often had trouble finding a WiFi connection, I created this Camino Finisterre eBook. We converted our web pages to be used as a Camino Finisterre guide book that can be saved to your device for reading and using offline! The material in our personal guide is identical to the web pages, so you know exactly what you are getting before you purchase it. Everyone also knows that it is much easier to read a large volume of information in an eBook or document format than it is online. We have edited our web page information, specifically for ease of reading. You can read our Camino Finisterre eBook on the airplane, or the night before your pilgrimage day, to get an idea of what to expect the next day, without worrying if you have an adequate WiFi connection. You can even pull up the maps during your day, if you like to keep track of your location. This guide book, like on our Camino Finisterre web pages, contains bonus information on Muxía (our favorite place). See why I love this place so much. Please be advised that this is a digital product only. You will not receive any type of print or hard copy of anything! Don't worry - PayPal converts your currency automatically - see the price in your currency by clicking here. *When you click the Buy Now button, you will be directed to my Body Window Store Checkout Page on PayPal. Make sure if you wish to download to an Apple iPad or iPhone that you have a reader installed before attempting to download directly to it! Check your device for iBooks, Notes, Adobe or another reader of your choice compatible with Apple products. Apple does not allow for direct downloading to its devices. If you are successful downloading to an Apple device, don't forget to save it somewhere, usually iBooks, or you may have to download it again after you close the document. For Apple users, your best option might be to download the eBook to your computer first, then save it to a cloud service, like iCloud, Dropbox, Google Drive, Mega, One Drive, etc. You will then be able to access the PDF file on your mobile iOS device from the cloud service. You will have to have the cloud service installed on your device, through their app. Then just download the document to the device from the cloud. Please don't forget that you will not receive anything in the mail, or any paper product of any type! This is a digital product only. You will receive an email with a link to download the eBook. If you cannot find the email, please check your email's junk folder. Look for an email from the Body Window, LLC. If you are not a techie, and need help downloading the PDF document, please feel free to contact us and we will assist you. Make sure your device has sufficient memory to handle the file. It may take awhile to download. The file is 190 Mb and 146 pages long. It is our wish that our Camino Primitivo eBook Guide will assist you in your planning and therefore add to the success of your Camino. Join all those who have told us that with our guide, we were spot-on with our information, that it enriched their own Camino, and that there were few surprises along the way! However, as any Camino is a fluid thing, we are open to any suggestions for improvement, corrections and comments! Just contact us. We are happy to update our guide book if the information has changed since its writing. Without a written version, we can very quickly and easily update our guide book! We thank-you and all the other pilgrimage travelers reading this thank-you!